The Wool Blend Comfy Futon is the perfect combination of inner firmness, outer softness, and overall flexibility. A wonderfully comfortable and cozy bed for your pet. The inner mattress is a calico cotton cover overstuffed with high loft wool/polyester filling. Quilted to keep it’s shape and encased in a removable zip-off printed cover. 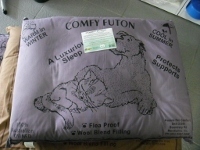 The wool blend filling has been treated with a bio-degradable, environmentally friendly, mild salt like detergent that stops fleas and other insects from infestation. Both the cover and the inner mattress are machine washable. Replacement covers are available. Great for dogs and cats for in-house use, kennels or travel. Available in 4 sizes and 2 colours – brown or grey.